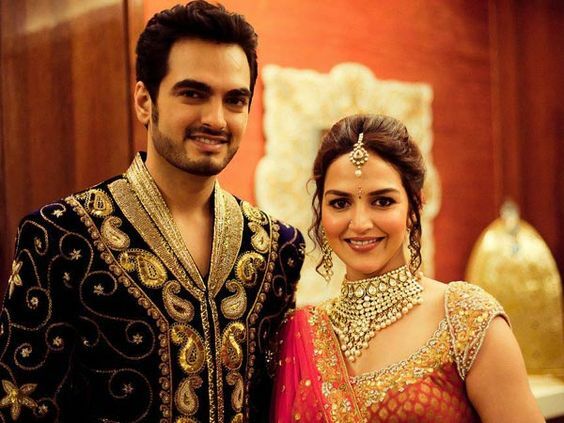 My favourite way to glam up an ethnic wedding look is with a Maang tikka. 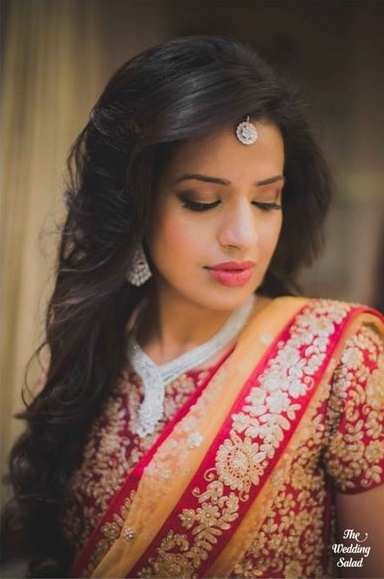 Middle parted hair is how I used to rock my maang tikka in the past but recently I have been smitten by the jhoomar trend and I started searching for more hairstyle ideas which fit both tika and jhoomar elegantly without looking bridal. 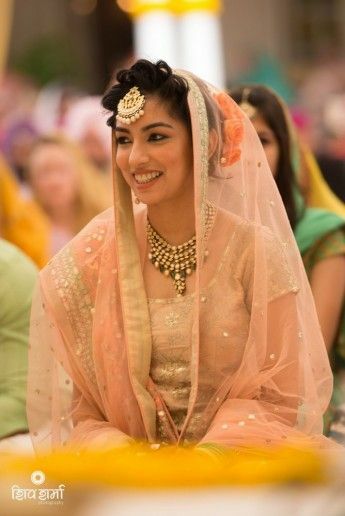 Maang Tikka is a traditional hair accessory which majority of brides wear but women of all ages can give this accessory a try for special traditional occasions like diwali, eid or weddings. 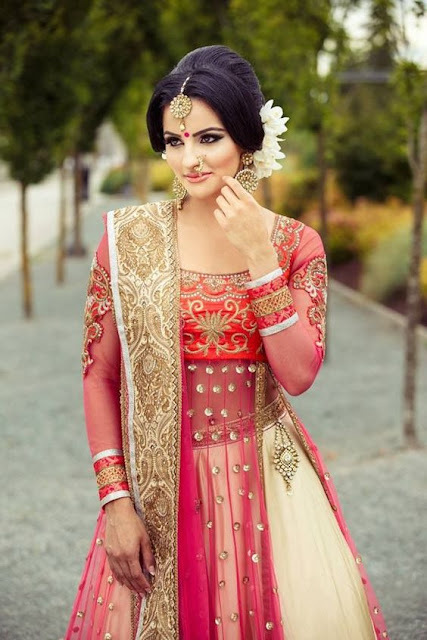 To get your maang tikka ethnic look right you need to complement it with a right hairstyle as all hairstyles dont look good with a maang tikka. If you really want your hair accessory to sit gracefully on your hair try one of these pretty hairstyles. 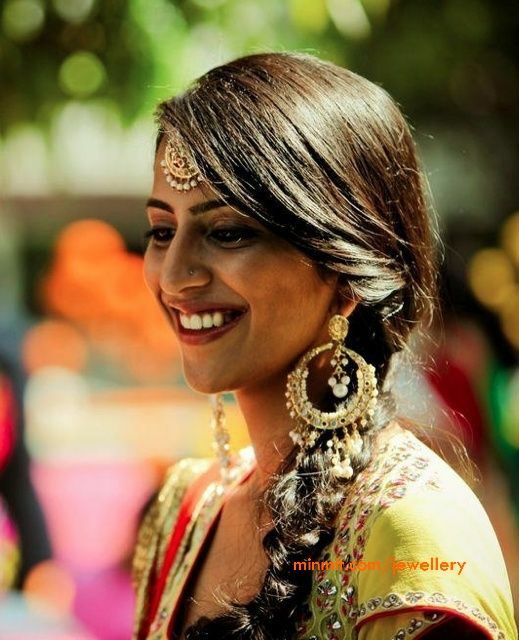 When wearing a Maang tikka you just cant go wrong with middle parted hair as the Tikka chain sits comfortably in the hair partition . 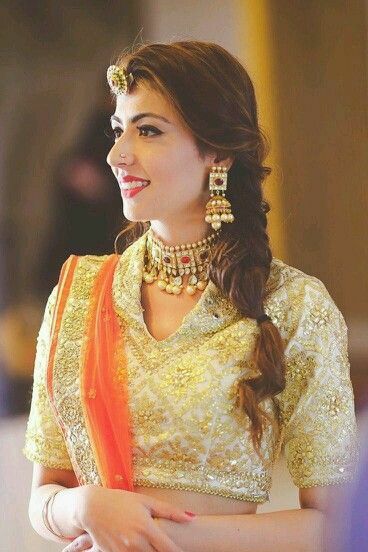 This partially middle parted hairstyle is my favourite when it comes to wearing a maang tikka and I have rocked it many times. I just partition front portion of my hair and then use a clip to pull back some hair for it to look like a puff. 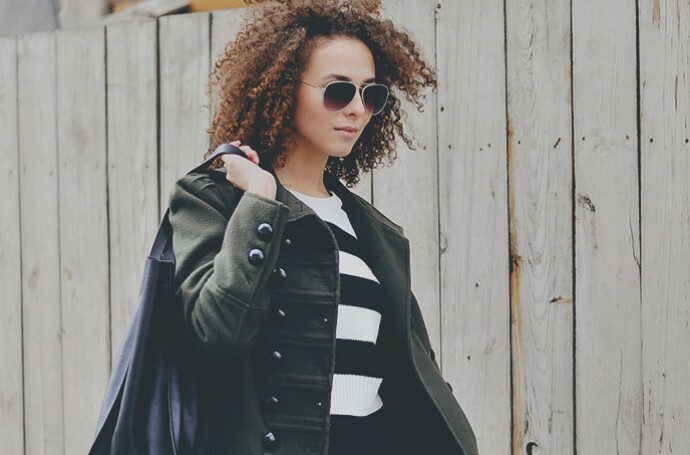 You can iron out your hair for a sleek look or go for some curls for a wavy layered look. A side braid is fun and fuss free and you can try different braid styles like fishtail braid or messy french braid . Glam up your braided look with an over sized tikka taking care to hide just the tikka chain and not the tikka itself. If you like open side parted hairstyle you can add a tikka even to this hair look but make sure sure your tika is small to balance out the wavy hairstyle. Hair buns works nicely for traditional events and you can glam it up with a tikka and leave loose hair flicks on both sides to frame your face. The simplest hairstyle to wear a mang tikka is to middle part your hair and leave them open . I dont like this hairstyle much because my hair start behaving like a rebel and flying all over the place, sometimes sticking to my lip gloss too! If you want to try this hairstyle I suggest you use a nice hair hold spray and serum to keep your hair in place. A pouf plait also works as a nice maang tikka hairstyle especially for south Indian weddings or with borla style tikkas. Bun hairstyles look good for weddings but why go for boring old style buns when you can try fun buns with twisted fronts and tikka in middle. This hairstyle works best when you are wearing dupatta on your head, think nikaahs and anand karaajs! 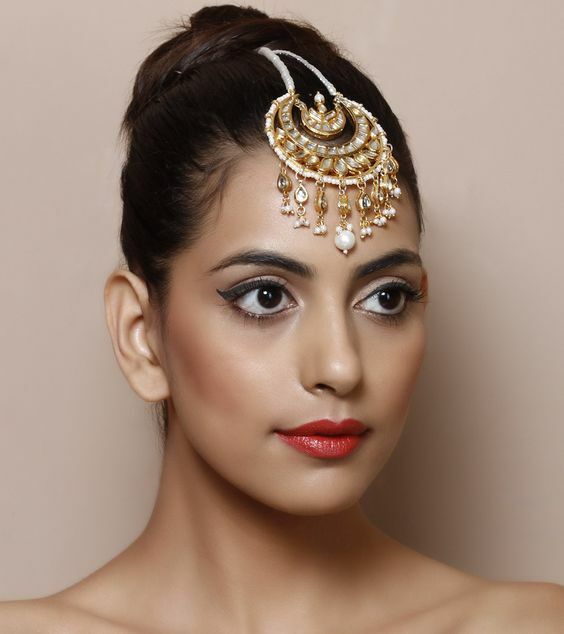 This fierce bun hairstyle is super kitch and sleek making for a fabulous sangeet or mehndi day haistyle. 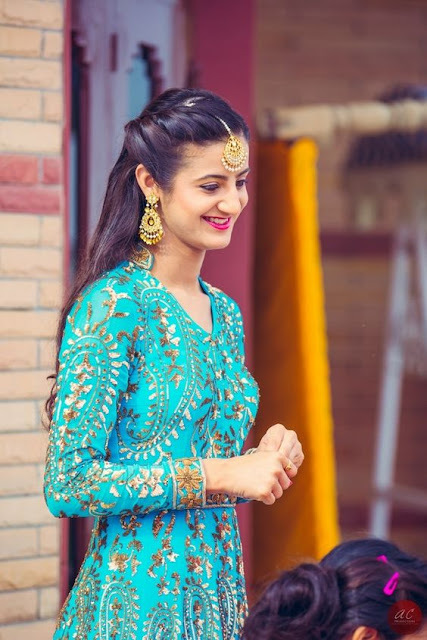 if you are wearing an indo western outfit and wanna try something out of the box try this gelled in top knot with an oversized tikka and keep rest of your accessories minimal.  - Glamorous hair accessories are in trend these days. 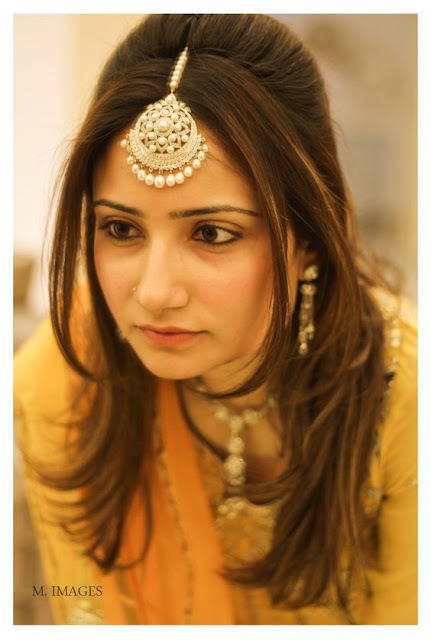 Dont be afraid to experiment with head jewellery and swap your tikka with a matha patti , jhoomar or a side paneled tikka. - To keep Maang tikka in place most women use a booby pin but it never works for me as I find the tikka always moving on its own will. It is better to use eye lash glue to stick the pendant part to your forehead. Even a small piece of double sided tape can work nicely. - Always set your hair with a hairspray to keep them in place or you will end up taming unruly flyways all through the event. Which Maang Tikka Hairstyle would you try?